Come learn Regular Expressions for Google Analytics with me. 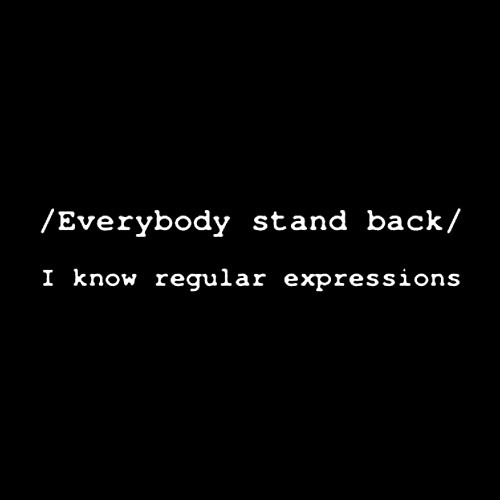 I am learning Regular Expressions for Google Analytics and teaching with each lesson. This is why I roll them out slowly – each expression requires a lot of research. I have been awed at this process because the explanations are so opaque before I understand them, and once I learn them, they make perfect sense. Tonight, let’s talk about square brackets, and I hope you’ll see what I mean. This is exactly what they mean, it just sounds hard because they don’t tell you how to create the list and how to define an item. Simple explanation: When you use square brackets, each character within the bracket is an item. Look at this sample list with five items in it, each of which happens to be a vowel: [aeiou]. The hard part is undertanding that you don’t need anything to separate the characters, and that each item in the list is only one character. That means, instead of creating a list like this [abcdefghijkl], you can create it like this: [a-l], and it means the same thing — only one letter out of the list gets matched. You can also combine the range method and the brute force, type-them-all-in method and create a list like this: [a-lqtz], which matches any one letter between a and l, or q, or t, or z. Special case: Sometimes — perhaps often — we really want the dash to be one of the characters we are searching for. Maybe we want to see searches of luna-metrics and lunarmetrics and lunammetrics. In that case, we put the dash at the beginning or end of the list, like this [-rm]. That means that the full RegEx which would match the three lunametrics keywords above would be luna[-rm]metrics. This is because the phrase will start with luna, end with metrics, and in between will have a dash, an r, or an m. Those are the only choices in the little list I created, the one that looked like this: [-rm].